Draft: 2001, Tampa Bay Devil Rays, 34th rd. January 29, 2019 RHP Chad Gaudin assigned to Mexico. November 30, 2018 RHP Chad Gaudin assigned to Charros de Jalisco. May 6, 2018 Leones de Yucatan signed free agent RHP Chad Gaudin. April 14, 2018 Acereros del Norte released RHP Chad Gaudin. November 23, 2017 Tomateros de Culiacan activated RHP Chad Gaudin. October 29, 2017 Tomateros de Culiacan placed RHP Chad Gaudin on the reserve list. October 4, 2017 RHP Chad Gaudin assigned to Tomateros de Culiacan. February 21, 2017 Pericos de Puebla traded RHP Chad Gaudin, 1B Daric Barton, 2B Manny Rodriguez, LF Nyjer Morgan, 3B Rodolfo Amador and CF Willy Taveras to Acereros del Norte for RHP Joaquin Lara. October 20, 2016 RHP Chad Gaudin assigned to Gigantes del Cibao. 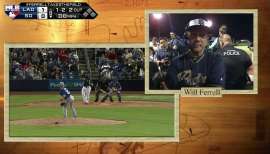 April 1, 2016 RHP Chad Gaudin assigned to Pericos de Puebla. November 6, 2015 RHP Chad Gaudin elected free agency. September 15, 2015 Oklahoma City Dodgers activated RHP Chad Gaudin from the 60-day disabled list. 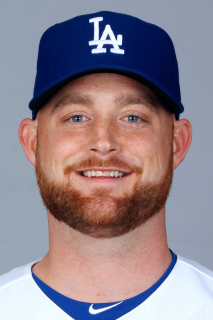 August 6, 2015 Oklahoma City Dodgers transferred RHP Chad Gaudin from the 7-day disabled list to the 60-day disabled list. 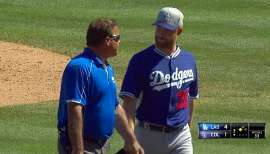 April 9, 2015 Oklahoma City Dodgers placed RHP Chad Gaudin on the 7-day disabled list. February 25, 2015 Los Angeles Dodgers signed free agent RHP Chad Gaudin to a minor league contract and invited him to spring training. 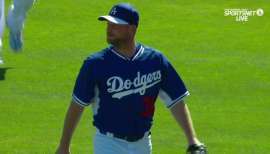 February 25, 2015 RHP Chad Gaudin assigned to Oklahoma City Dodgers. February 13, 2014 Philadelphia Phillies released RHP Chad Gaudin. January 21, 2014 Philadelphia Phillies signed free agent RHP Chad Gaudin to a minor league contract and invited him to spring training. October 1, 2013 San Francisco Giants activated RHP Chad Gaudin from the 15-day disabled list. August 20, 2013 San Francisco Giants placed RHP Chad Gaudin on the 15-day disabled list retroactive to August 17, 2013. Carpal tunnel syndrome. July 7, 2013 Chad Gaudin roster status changed by San Francisco Giants. July 7, 2013 San Francisco Giants activated RHP Chad Gaudin from the 15-day disabled list. June 24, 2013 San Francisco Giants placed RHP Chad Gaudin on the 15-day disabled list retroactive to June 21, 2013. Bruised right elbow. March 26, 2013 San Francisco Giants selected the contract of RHP Chad Gaudin from Fresno Grizzlies. December 7, 2012 San Francisco Giants signed free agent RHP Chad Gaudin to a minor league contract and invited him to spring training. November 3, 2012 RHP Chad Gaudin elected free agency. April 1, 2012 Miami Marlins selected the contract of Chad Gaudin from New Orleans Zephyrs. April 1, 2012 Miami Marlins activated RHP Chad Gaudin. December 13, 2011 Miami Marlins signed free agent RHP Chad Gaudin to a minor league contract and invited him to spring training. December 13, 2011 Chad Gaudin assigned to New Orleans Zephyrs. November 2, 2011 RHP Chad Gaudin elected free agency. August 5, 2011 RHP Chad Gaudin assigned to Las Vegas 51s from Toronto Blue Jays. August 4, 2011 Toronto Blue Jays signed free agent RHP Chad Gaudin to a minor league contract. July 21, 2011 Washington Nationals released RHP Chad Gaudin. July 19, 2011 Washington Nationals designated RHP Chad Gaudin for assignment. June 21, 2011 Hagerstown Suns sent RHP Chad Gaudin on a rehab assignment to Syracuse Chiefs. June 19, 2011 Chad Gaudin assigned to Hagerstown Suns. June 15, 2011 sent RHP Chad Gaudin on a rehab assignment to Potomac Nationals. April 27, 2011 Washington Nationals placed RHP Chad Gaudin on the 15-day disabled list retroactive to April 26, 2011. Right shoulder inflammation. March 30, 2011 Washington Nationals selected the contract of Chad Gaudin from Syracuse Chiefs. March 30, 2011 Washington Nationals activated RHP Chad Gaudin. December 17, 2010 Washington Nationals signed free agent RHP Chad Gaudin to a minor league contract and invited him to spring training. December 15, 2010 Syracuse Chiefs signed free agent Chad Gaudin. November 1, 2010 RHP Chad Gaudin elected free agency. October 25, 2010 New York Yankees activated RHP Chad Gaudin. October 5, 2010 New York Yankees reassigned RHP Chad Gaudin to the minor leagues. May 26, 2010 RHP Chad Gaudin assigned to New York Yankees. May 16, 2010 Oakland Athletics designated RHP Chad Gaudin for assignment. March 28, 2010 Oakland Athletics signed free agent RHP Chad Gaudin. March 25, 2010 New York Yankees released RHP Chad Gaudin. August 9, 2009 New York Yankees activated RHP Chad Gaudin. August 7, 2009 San Diego Padres traded RHP Chad Gaudin to New York Yankees. April 27, 2009 San Diego Padres selected the contract of Chad Gaudin from Portland Beavers. April 14, 2009 Portland Beavers signed free agent Chad Gaudin.